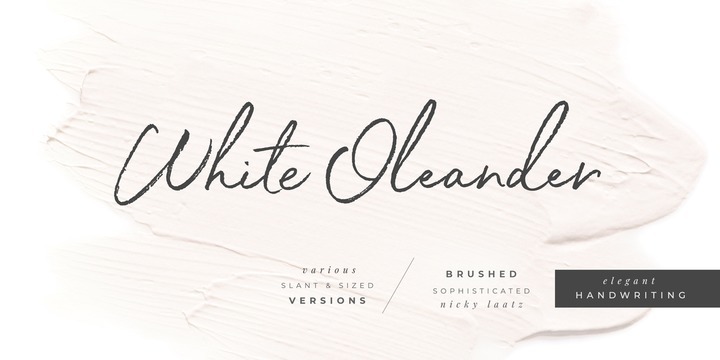 White Oleander is a handwritten typeface created & published by Nicky Laatz whcih is available in 4 styles, useful Open Type features, ligatures, upper & lower case alternates etc. This versatile font with an elegant, sophisticated touch is ideal for editorial use, signature, wedding, packaging, magazine etc. Enjoy! Price: starting from $20 for one font to $25 for all 4 fonts. A font description published on Wednesday, April 11th, 2018 in Fonts, Nicky Laatz, Nicky Laatz by Alexandra that has 3,047 views.